When I was little, my mother gathered my brother and I around the kitchen table to make ornaments. You know the kind where you pour tiny beads into wreath and Santa Claus shaped molds, stick them in the oven, and make DIY stained glass? We made a whole day of it. And when we pulled those precious gems out of the oven, we wrapped them up and gave them away as gifts to friends and neighbors. It was one of my favorite days ever. My mom did DIY before DIY was cool. And that’s when I learned, at the age of 5 years old… the best presents are the homemade ones. The ones that maybe didn’t cost more than a dollar or two but are filled with time and care. So when I stumbled upon this $30 bench at the thrift store, I knew time and care was all it really needed. Last December, I shared how I (ahem… I mean, Santa) gave an old thrifted dollhouse a sweet makeover for Olivia. To this day, she still adores it. This year though, I thought I’d snag this bench for my mom since she’s always wanted one at her kitchen table (for a certain squirmy-bottomed 4 year-old). To get rid of the yellowy-orange wood tones and cover up the scuffs and rough spots, I gave it two quick coats of Fusion Mineral Paint in Cranberry. It took me less than an hour to paint it (and to chuck the icky seat cushion that came with it), and this bench was good as new. 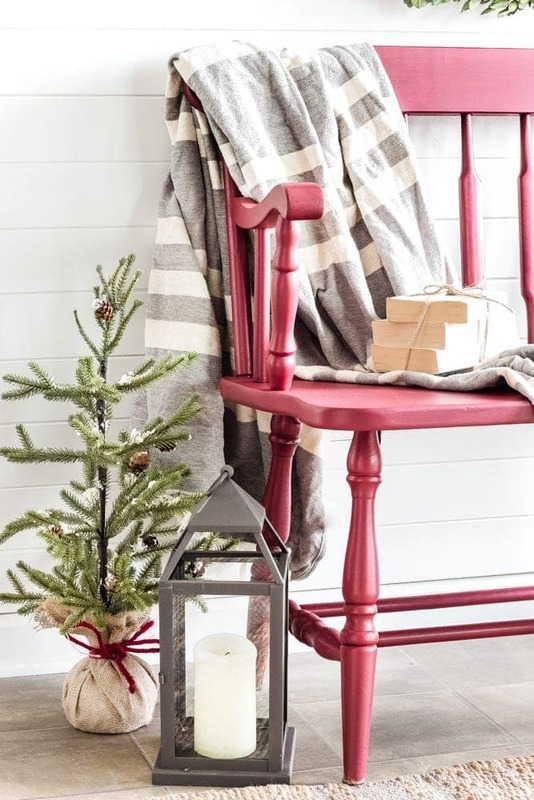 I styled it all cute for Christmas in our entryway to snap a few quick shots of it. 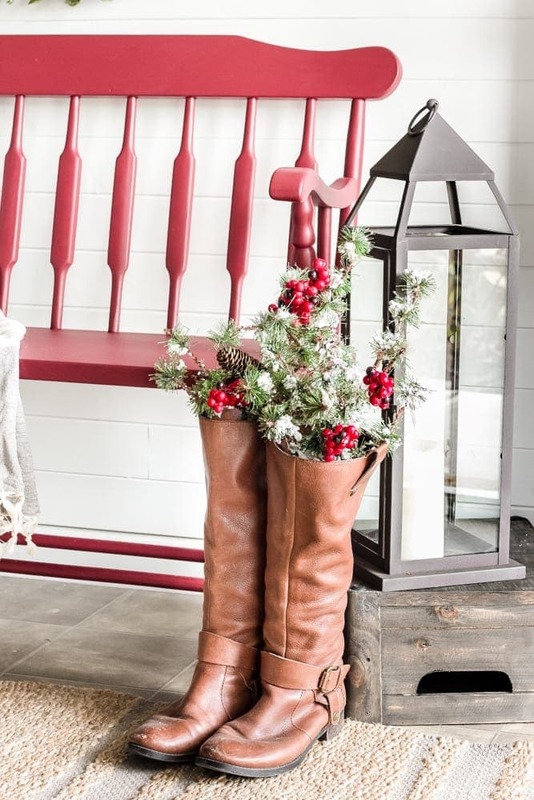 Also, if I didn’t love wearing these comfy boots so much, they might just stay as permanent makeshift vases in our entryway. I literally just ran around our house grabbing odds and ends to accessorize it since we’ll be hauling it over to my parents’ house soon. Do you do that all the time too? 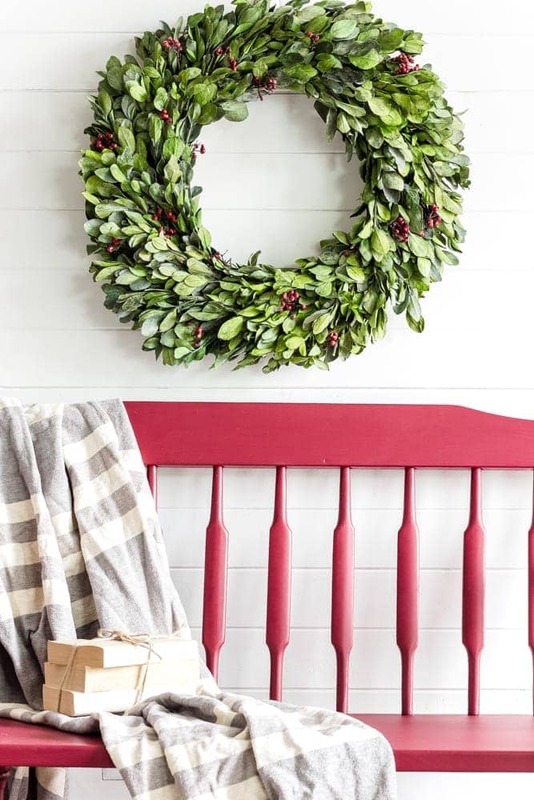 Steal decor from all of your house? Items are constantly moving around here. Nothing is safe. 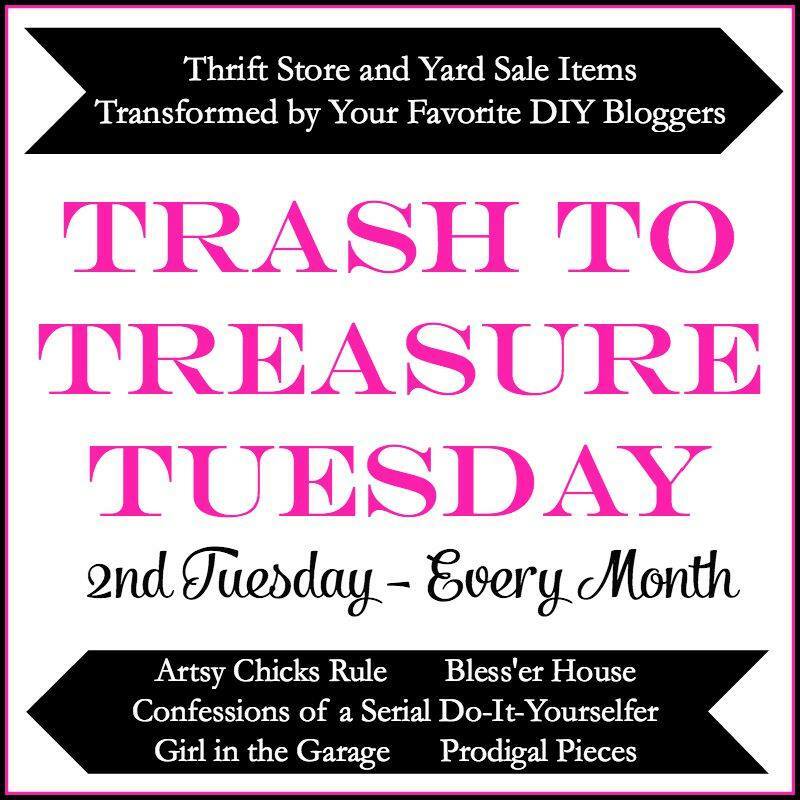 My other thrifty blogger friends are sharing their own trash to treasure transformations too. Just click the links below to see the makeovers. And don’t forget to join us on Instagram to share your own with the hashtag #TrashToTreasureTransformation! Have you done any homemade gifts for Christmas this year? Or tackled any awesomesauce thrift store projects? 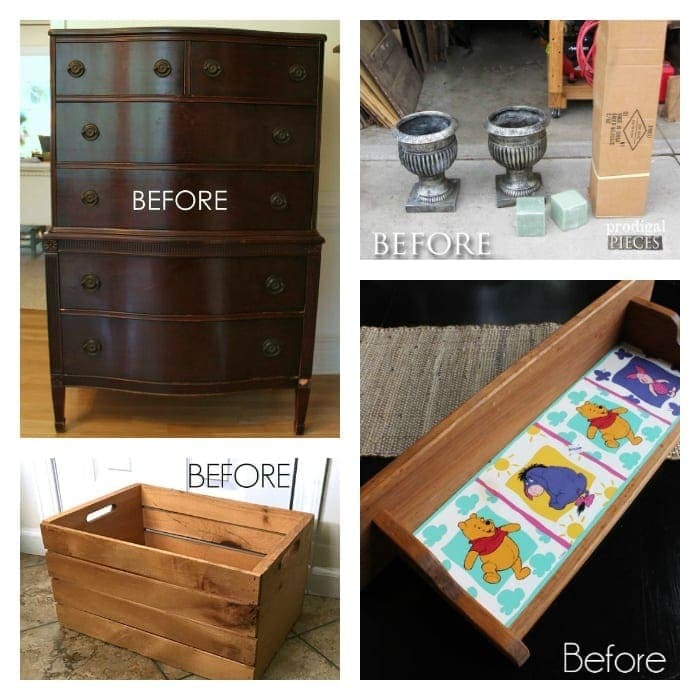 If you want to see any past Trash to Treasure makeovers, you can check them all out here. A big thanks to Fusion Mineral Paint for providing paint to sponsor this post. What a treat to have a mom that did those things with you. I know I am so thankful for my parents for the very same reason. Love the color you picked and even better that it is now your mom’s. Merry Christmas! Those crafy mamas are the best. I’d say your little ones are just as lucky to have you as their crafty mama, Larissa. 🙂 Merry Christmas to you too! Did you use any kind of sealer after painting? No, I didn’t use a sealer. That’s one of the things I like about this paint. A sealer isn’t required. I’ve used it on a lot of our furniture now and it holds up way better than chalk paint. 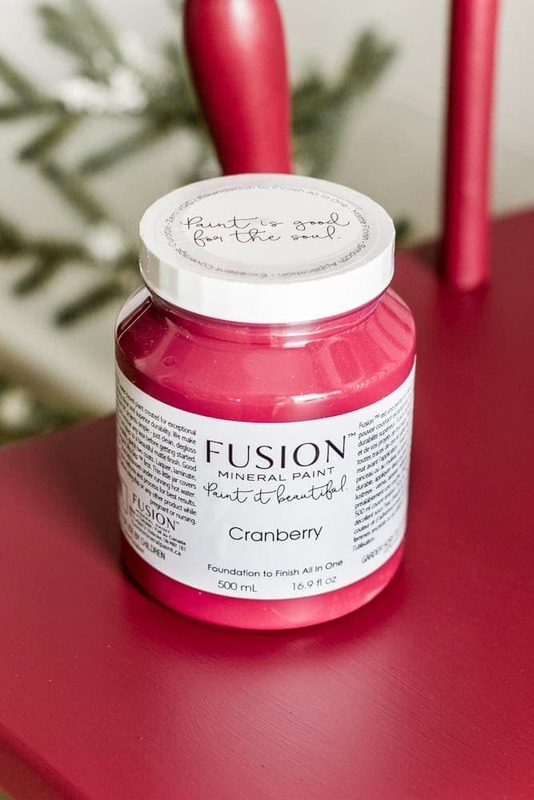 Never sick of Fusion paint – it’s amazing!! And I’ve been dying to see the Cranberry color “in person”. The bench looks great! Can’t wait to play along on Instagram! Yes! Love the stuff. The Cranberry color is even prettier in person. My photos don’t do it justice. Can’t wait to see what you share, Christene! That Cranberry is a gorgeous color!! Beautiful bench! Beautiful transformation! I am going to have to try this paint soon. I have used Annie Sloan’s chalk paint on most of my diy’s. Thanks, Tara! I’ve used Annie Sloan on a lot of our furniture too and like this one the best mostly because I like its durability and the fact I don’t have to seal it. I still love the look of Annie Sloan too though. L.O.V.E! That cranberry color is gorgeous! May have to try it! Aww, How sweet! I can’t wait for this to come “home”. I may have done DIY when it wasn’t “cool” but you have taken it to a whole new level I would never have dreamed of. Thank you for the bench and for the sweet memories. Love you, Mom. Dawww thanks, Mom. Love you too! I promise I’ll remember this bench next time I come over. I’ve forgotten two times now. Call me and remind me next week before dinner! Lauren you are sweet to give that to your mama when it looks so good there! She’s wanted one like this for years, so I probably couldn’t get away with keeping it anyway. Haha! 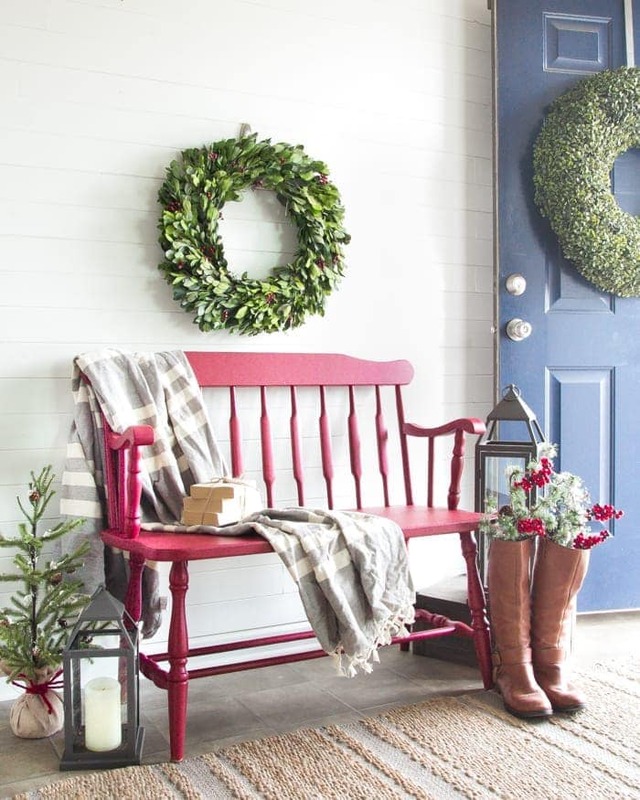 I love the new color Lauren, and it’s absolutely festive on your porch dressed up for Christmas! I know your mom will love it too. It’s really cute in red. I’m so glad that you could see it’s potential!! Thanks, Bonnie! I’m not usually a red kind of girl, but this little bench was just destined for it. LOVE the bench Lauren, and the COLOR! Amazing! I love it and the paint sounds good too. I’d like to be keeping that bench, but at least you’ll get to see it at your mom’s house. 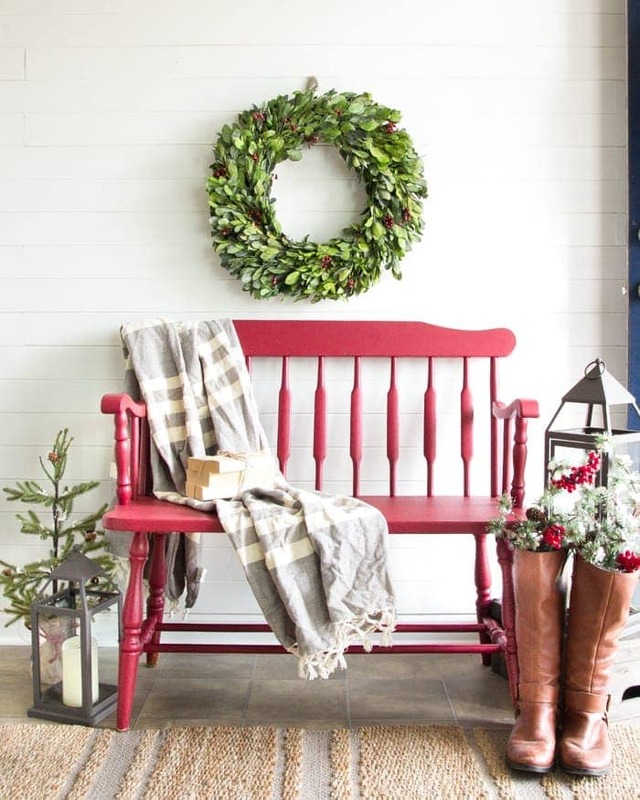 Oh my Lauren what a beautiful color for that bench and so beautifully styled for the holidays. 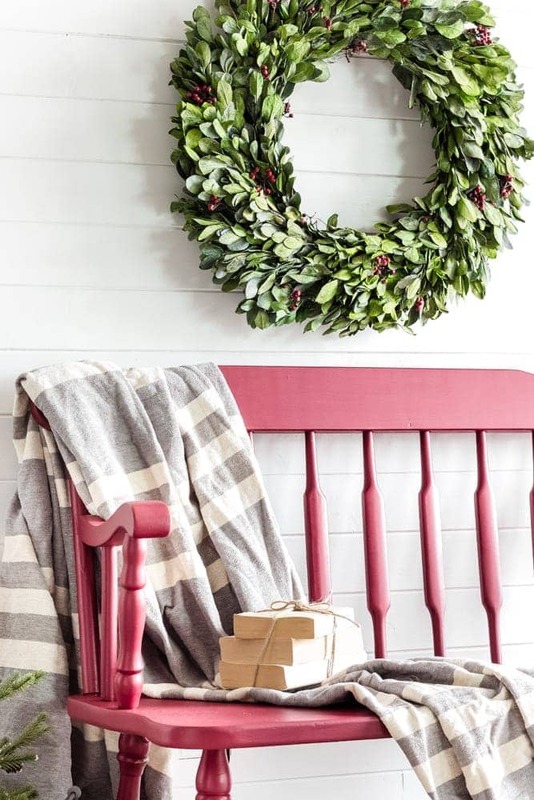 I couldn’t agree more about handmade gifts being the best to receive (and give) and how lucky are your parents to receive such a beautiful bench. Pinning to share. Looks great. I really need to grab some of that paint. Love the color perfect for the season. Hope your mom enjoys this cute bench! What a great color! 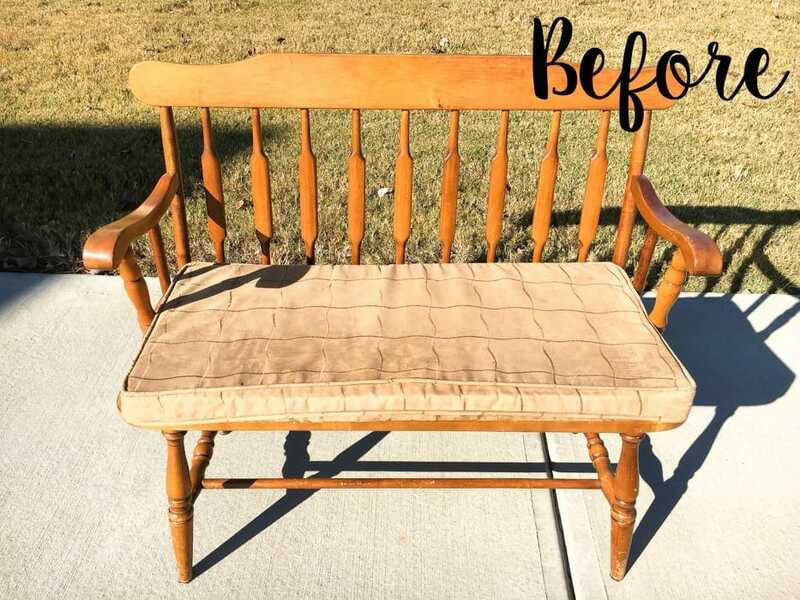 I love this little bench makeover- I know your mom will love it! Hi Lauren! Did you clean and/or sand the bench before painting? I love the color! Thanks. Hi Tina! I didn’t have to clean this one really at all. If a piece is really grimy or has wood oil on it, I sometimes wipe it down with some liquid deglosser and it does the trick. Yes! LOVE their paint! I’m the same way. That sealer step is my least favorite. Love how your bench turned out! That red is great. I’m going to have to try out that paint! This makeover is absolutely stunning. I love the new colour. I hope you’ll stop by to share it at The Crafty Corner link party with us 🙂 I would like to feature it! Thank you, Antonella! Sorry for my delay. I took a break for some family time. Thank you for the invite! Oh my gosh I hear ya on the prep work! That’s one of the reasons I don’t paint very much. This is a beautiful transformation and I love the color. Merry Christmas!